In July Jung’s impressive directorial debut, produced by critically acclaimed film-maker Lee Chang-dong, a city cop relocated to the sticks befriends a moppet with a crummy home life. 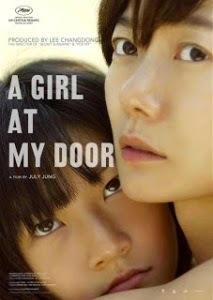 Starring Bae Doo-na and Kim Sae-ron, A Girl at My Door (2014) is at once a plangent character study and transgressive drama. For the child at the centre of the narrative exhibits manipulative tendencies of a sociopathic leaning. There’s been a scandal. Only, we don’t quite know what’s gone on. Some might well accuse the writer-director of obfuscation or lacking clarity in the storytelling. However, seen as a bold creative choice, it has thematic weight and a significant bearing on how you read the ending. It is inferred Lee Young-nam (Bae) being homosexual and a keen boozer has caused a bit of a kerfuffle back in Seoul. Wishing to keep her drinking habit a secret from the locals, she disguises the hooch in water bottles. This, too, in a village where everybody appears permanently sizzled. Bae, perhaps best known to western audiences for Bong Joon-ho’s The Host (2006) and the Wachowskis’ Cloud Atlas (2013), is cast in a somewhat unusual role. Lee Young-nam carries with her a great deal of shame and inner torment. The weary look says it all: she is a person barely coping. In a moment of explicit poignancy, Seon Do-hee, the increasingly troublesome teenager, who takes to following Lee Young-nam around like a puppy, asks her new best friend why she drinks so much. ‘To sleep,’ she replies, matter-of-factly. Among the weighty social themes explored in A Girl at My Door – everyday sexism, homophobia, alcohol and child abuse – none are as focused upon as intently as the relationship and questionable dynamic between two lost souls. The lead actors, in their portrayals, both are excellent, and draw out much sympathy and understanding. They’re outcasts finding solace in each other’s company before Seon Do-hee’s unscrupulous behaviour and constant demands for attention have a potentially disastrous result. Exactly what are Lee Young-nam’s intentions towards the girl with whom she forms a bond? Does she see it as her duty to ‘serve and protect’? Is she displaying dormant maternal instincts, or is there something else going on? As mentioned, the final scene, depending on how you read the main character’s backstory and motives, can be taken two ways: hopeful or exceedingly bleak. That July left it open-ended is a wily move.